Anyway! 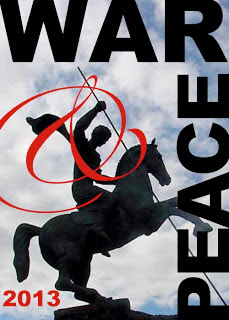 This month's reading was all about the war in War and Peace. How did you feel about it? One thing is that I'm sorely lacking in the historical context of this conflict. I plan to read up on it this weekend, but I don't have the time right now. So I'm not exactly sure about motivations and reasons for fighting, but I do know that it seems like in every historical fiction book I read where Russia's at war they are doing badly. (if anyone is well versed and wants to give me some cliff notes in comments it's much appreciated!) And that's the case here, even the one victory they have in this section is really more of a defeat. Also of course, there was Prince Andrei who had his own visions of glory and leading the troops to some sort of victory only to realize that it was in fact a terrible messy gory business. So I guess I feel like the idea of war came up against the reality of it. But gosh no wonder Russia's a bit of a mess, look at their diplomat! He was more interested in saying memorable things than anything else (even though that was very funny) and the emperor Franz was also funny only having his list of questions to ask with no interest in the actual answers. Overall, I found the section very readable and I'm looking forward to having more time to look through it again with a map and some history in mind! What did you guys think? Were you bored or did you enjoy it? I don't really have any questions this month, but if you wrote a post, drop the link the Mister Linky or feel free to discuss in comments. I'm looking forward to knowing what you thought!